Any company that’s delivered digital signage solutions knows the job isn’t as simple as it first looks, and that successful projects owe a lot to getting the right advice and doing effective upfront planning. Here are seven critical steps and considerations that will set any systems integrator or services provider on the right path to providing successful digital signage solutions for their customers. They’re all the same, right? Actually, no. Display manufacturers have a lot of display series because each meets different needs: Like resolution, brightness, operating hours, videowall-ready or interactive capabilities. The display might be right simply because the price works with capital budget limits. These days, integrators also need to be thinking about whether an external PC or media player is needed, since many commercial display manufacturers now offer smart displays with built-in media players — something Samsung pioneered with its Smart Signage Platform. Finding the right display starts with understanding where the screens will go, how they will be used and the kinds of content they’ll show. Then you can look at specs to ensure the display will bring its content to life. Installing may look easy, it’s often more complicated than meets the eye. Seasoned installation professionals understand the total job, which starts with having the right paperwork in place to meet workplace safety and security considerations of the venue. 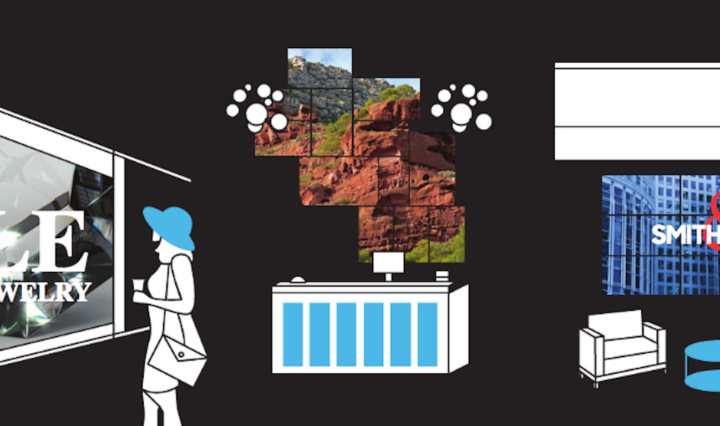 Explore the possibilities of videowall technology. They also insist on site surveys, so they arrive on job sites knowing where they can get power, and understanding the physical constraints and barriers the building presents. They also know how to properly align screens and hide any potentially visible cables. Look closely at digital signage jobs in the field and you’ll find badly executed installations, with cables dangling behind screens, video walls with misaligned seams, and screens showing lost signal messages because the cabling was done wrong. The state of the art in digital signage is integrating displays with other building systems, so the two systems are effectively collaborating. In retail, a point of sale or inventory management system might be directly informing a digital signage menu board about pricing and what to display or promote to shoppers within the store. In a hotel, it might be the room management system providing occupancy data that populates digital lobby directories and meeting room signs. There are scores of digital signage software options on the market, most of them marketed as user-friendly. Many are not anywhere as simple as touted, however. Talk to your client about how they want to use digital signage, and how much they want to learn and take on. A macro trend in the industry now is managed services — with clients of all kinds saying they want to use digital signage, but have a solutions provider to manage the system for them. Bottom line: Unless the client’s digital signage solution is core to its business, that client won’t be happy with a system that needs days of training and an operators manual. Present your clients with systems that can either be easily navigated if issues do arise, or content needs to be changed on-site. It doesn’t matter how big and beautiful a screen looks, if the content doesn’t interest the viewers, it’s a wasted investment. Smart solutions providers work with clients to develop programming plans that itemize the type of content, duration, change frequency and then creative production costs. Pre-designed templates that come with systems may address some needs, but clients should be encouraged to allocate an ongoing budget for a third-party creative company that understands the medium, and can steadily deliver creative that reflects the client’s brand and needs and gets noticed by viewers. Any digital signage platform can do the basics of getting media files to play one after another on a screen, but more sophisticated platforms have tools that enable complementary systems to work seamlessly with one another, and most importantly, have the sort of robust device management tools needed to maximize uptime and control operating costs. Many digital signage software solutions can’t do much more than confirm that a media player is operating, regardless of location. When there’s a real problem, field service calls costing $225 an hour may be needed. A robust device management platform allows operators to resolve almost any software-based problem, short of replacing equipment, from a remote PC. Think of displays like you think of cars. They’re beautiful when new, but they come with multi-year warranties and supportive dealers to address any long-term issues and maintenance. You want the same thing with displays and other key hardware components. Look for the levels of training, certification and ongoing support that’s available, because the programs are not all the same. That’s why Samsung offers its Partner Program, which allows enterprises to receive additional training and certification on the latest display technologies, hardware and trends. Ask questions, and develop a partner and support system that can provide answers, and your company will be on the right road to delivering digital signage solutions that work clients and their audiences. With digital signage technologies being able to do more and provide richer experiences for viewers, customers are looking for channel providers and installers that can do it all — from installation to maintenance. In order to fully reap the benefits of digital signage, developing a total cost of ownership model is essential.